Is it time to say goodbye to our little friends? MicroSD cards are serious business, or at least that's the impression given by the uproar surrounding any major Android handset that doesn't include a slot for one. But are they really necessary? There's no denying that they can be appealing. Regardless of how much storage a handset has a microSD card can boost it - and with the launch of SanDisk's 128GB card it can be expanded massively. That can certainly be useful for anyone who wants to jam their phone full of media, but even if you don't it's comforting to have that safety net, knowing that the storage is there if you need it. But do you need it? Really? You might argue that there's no downside to having a microSD card slot even if it's not likely to get used, but that's not entirely true. For one thing they simply don't fit with the design ethos of some handsets. A year ago, there was a case to make that phones of a certain design, such as the unibody HTC One, can't easily support a microSD card slot and as design is one of its biggest selling points, to compromise that would be to compromise the whole handset. "Advances in our design and manufacturing processes have allowed us to introduce the microSD card without feeling like we need to compromise on design. "With last year's One, we felt the compromise was too large – particularly given the prevalence of free cloud storage – so we opted not to include microSD. This year, advances allowed us to revisit that decision if the customer demand warranted it." 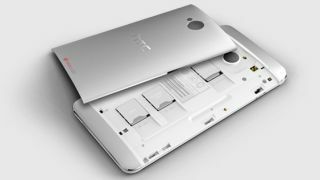 Sure, the HTC One (M8) would probably still look better without a covered slot breaking the lines, but it's always going to need a certain number of slots and ports anyway. Then again, a microSD card slot isn't necessarily desirable even when it can easily be included. Because while microSD cards sound good on paper in reality they can hugely impact a phones performance. According to a study carried out by Hyojun Kim at the Georgia Institute of technology, using a microSD card in your phone can cause it to become sluggish, with even basic tasks like web browsing suffering as a result. Overall performance can often drop by between 100% and 300% and in one case the study found that there was an incredible 2000% decrease in performance. Even at the lower end that's a massive loss in performance and is an unacceptable trade off for some extra storage, particularly on higher end handsets where you're paying hundreds of pounds extra for a boost in specs. The reason for the performance loss is simple, microSD cards themselves aren't fast enough. They can't keep up with the power and speed packed into modern smartphones. Though some are better at this than others and the brand and class of card you choose will have a big impact. Speed isn't the only issue either. Hardware hacker Andrew Huang gave a talk at Chaos Compute Club Congress, where he explained that "flash memory is really cheap. So cheap, in fact, that it's too good to be true. In reality, all flash memory is riddled with defects - without exception." The illusion of a contiguous, reliable storage media is crafted through sophisticated error correction and bad block management functions. This is the result of a constant arms race between the engineers and mother nature; with every fabrication process shrink, memory becomes cheaper but more unreliable. Likewise, with every generation, the engineers come up with more sophisticated and complicated algorithms to compensate for mother nature's propensity for entropy and randomness at the atomic scale." Which brings us to another key issue in the appeal of microSD cards, the fact that they're cheap. On the face of it the price can be appealing, particularly in comparison to paying through the nose for increased built in storage on a phone. Take the iPhone 5S for example. The 16GB model already retails for a whopping £549, but for a 32GB model you're looking at £629. That's £80 more for just 16GB of extra storage, while the 64GB model is yet another £80 more expensive - and that model clearly won't change for future models. Admittedly Apple products tend to be expensive anyway, but even a 32GB Nexus 5 costs £40 more than a 16GB one and other companies have similar price differences. Compare that to on average just £7-10 for a 16GB microSD card, £15-20 for a 32GB one or £35-45 for a 64GB one and the pricing does seem quite steep. You could argue that you're paying the extra for a product which isn't 'riddled with defects' but it still seems like a substantial difference, particularly when you can get a 1TB external hard drive for around £50. Robert Leedham, writer for Which? Tech Daily agrees, saying "microSD cards aren't essential in phones, but they're a cheap way to get added storage. Spending £15 for 32GB extra space on your mobile is a good deal in anyone's book." An argument could certainly be made that manufacturers should charge less for extra storage then, but given how slow and unreliable microSD cards are it's still often worth paying the extra to avoid them. Of course sometimes even paying for a high-capacity handset isn't enough, as you're still not going to be getting more than 64GB of storage, which should be more than enough for most people but it's still easy to fill - which is why 128GB phones will soon be an option for most, if not highly expensive. Smartphone storage can be even more limited than it initially appears to be too, as some of the advertised memory is taken up by the operating system and often by apps which can't be uninstalled. Leedham sees this as a major problem, arguing that: "Manufacturers will begin to offer more storage space if they think it will make more people buy their phones. Realistically, they need to ensure operating systems don't eat up too much existing storage space. Our recent storage test found only 8.56GB (or 54%) of a Samsung Galaxy S4 was actually available for you to use." Sometimes the hit is only a few gigabytes, as on the 16GB iPhone 5S and Nexus 5, which give you 12.20GB and 12.28GB of usable storage respectively, but other times you can be left with only around half the advertised amount, as in Leedham's example, making a microSD card all but essential. The good news is that phone storage is increasing. The iPhone 3G had a choice of 8 or 16GB of storage, the iPhone 4 brought the potential storage up to 32GB and the iPhone 5 boosted it to 64GB. Sadly Apple didn't continue that trend with the iPhone 5S, as that too tops out at 64GB, but there's always hope that the iPhone 6 might have 128GB of storage. You can see a similar increase among other manufacturers. HTC for example put just 512MB of storage in the Hero, but that went up to 1GB in the Sensation, 16 or 32GB in the One X and 32GB in the HTC One. Though the HTC One (M8) hasn't increased that any, instead opting to include a microSD card slot to augment the storage. But despite some recent flagships halting the march towards increased storage we're still likely to see it grow quite rapidly in the next few years. Tablets like the iPad Air already offer 128GB of storage and there's even a smartphone with that amount of capacity, unfortunately it's only available in China, but it's surely only a matter of time before 128GB of storage and beyond become common in phones. Given the rate that storage has increased so far that's likely to happen sooner rather than later and when it does microSD cards will become a lot less desirable.